Before reflecting on this day we wish to mention a special experience at Cruz de Ferro. We are carrying messages and prayers from many of you to the Cathedral in Santiago. Some of you also included prayers for us as we walk the Camino. Yesterday, sitting outside the little ermitage by the cross we read your prayers for us. These prayers were unexpected and humbling. They made us feel very loved. Thank you. Maxine and David ( our minister and her husband) included some beautiful prayers for sharing with other pilgrims. You do not know what a gift this is! When a group of pilgrims gather in a restaurant sometimes we are asked to identify ourselves by country and then do something representative of our country. This can be a dreaded moment as you can only sing “O Canada” so many times, and besides some other Canadian pilgrim will most likely be before you. 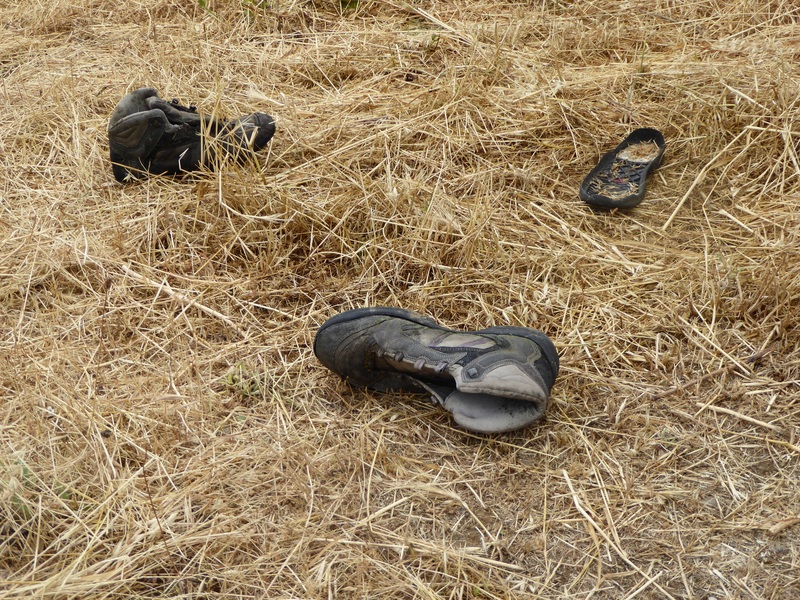 The prayers you included have a universality that are perfect for the Camino. Thank you for your thoughtfulness. Leaving Molinaseca we met a young family from France who were cycling the Camino. What was unique is that their child is two years old and travels in a bike seat on her father’s bicycle. We are daily amazed by fellow pilgrims. On the outskirts of town we had a special local approach us—-one of the town storks who was monitoring our path. When he/she took flight we realized that these are much larger birds than we had thought. 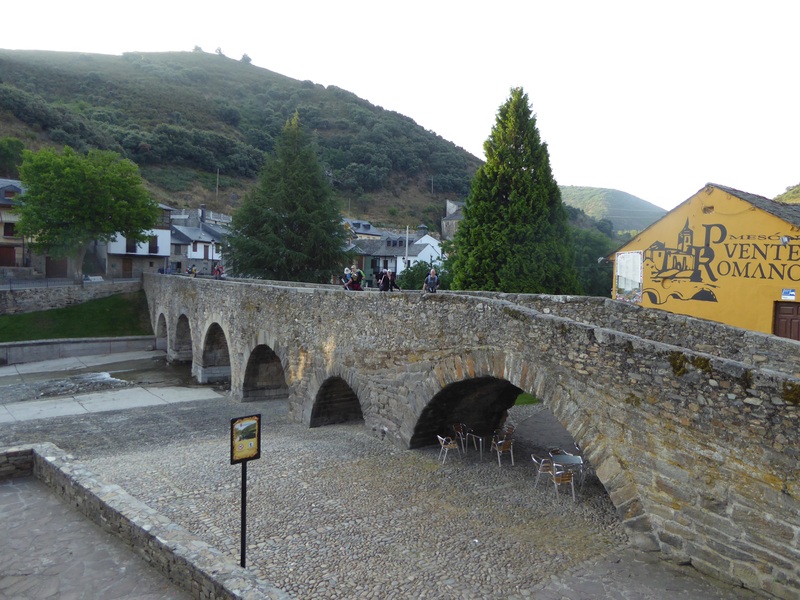 An interesting coffee stop was in Ponferrada across from El Castillo de Ponferrada. This was a Templar castle built in the 12th century and at that time functioned as a self sufficient town within a town. Some people believe that there are hidden messages within the castle’s 3 walls and 12 towers related to the Knight’s Templar association with the Holy Grail and the Arc of the Covenant. 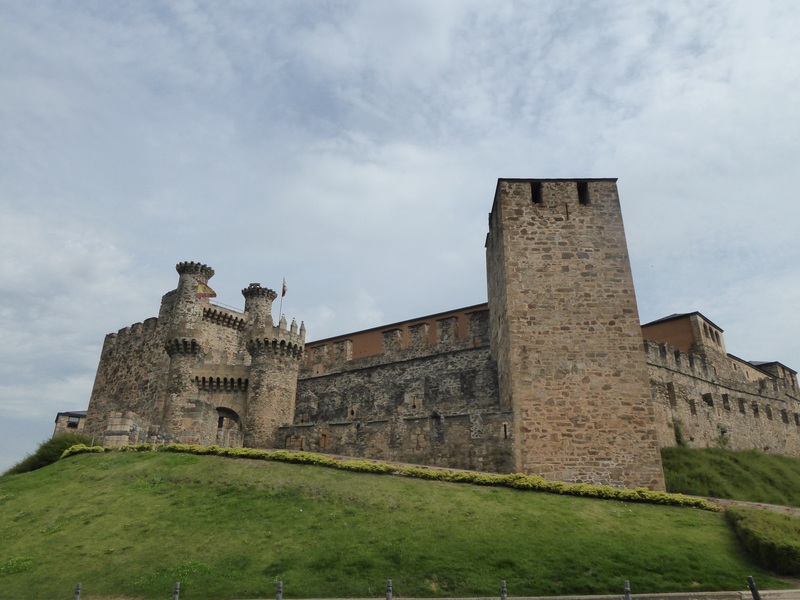 Ponferrada is an interesting town of 66,000 people and the capital of El Bierzo. It’s economy is based on coal mining, engineering,glass making, metal working, agriculture and wine making. It was a treat to be able to walk through the riverside park to reach the outskirts.—much nicer than the desolate industrial areas or rundown sections we have traversed in other cities. One of the delights today for Delana was finding poppy pods ripe for picking. 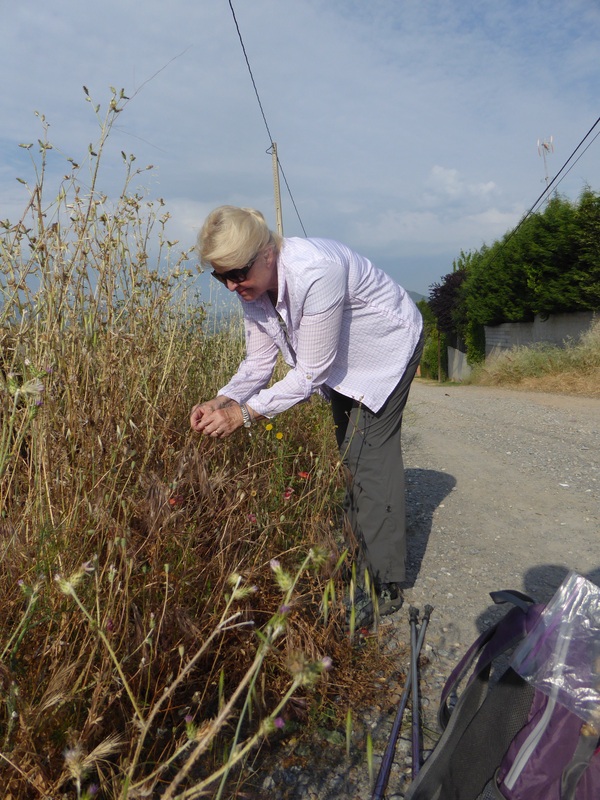 We have had poppy companions throughout our walk this year, but back on the Meseta they had not yet gone to seed. As you may have noticed we take breaks whenever we are able😊.In Spain when you purchase a coffee you always receive a complimentary piece of cake or a cookie. If you purchase any other drink— we especially like KAS Limon on a hot day, it comes with a free tapas with each drink. In this part of Spain, hospitality is genuine and generous..
Another interesting custom: the “Farmscia” is a very integral part of the community. The one that is open on weekends or at night leaves its green sign flashing to identify it. The Farmacia carries an assortment of skin/ beauty care products, foot care supplies, infant needs, and a wide range of medications— many of which are not over the counter medications back home. They function almost as a walk in clinic and the “farmaceutico” seems to be the first health care provider for many conditions. It is an interesting system and seems to work very well in the smaller villages that have no doctors. Today was a good walk— we met a teacher from Singapore, two couples from Australia and a young man from South Africa—all very nice people. As you can see the closer we get to Santiago, the more pilgrims we encounter. Upon arriving in Cacabelos we were concerned that our little casa rural looked just a little too rural but once past the dilapidated portion, it was beautiful. The room was immaculate and decorated with interesting antiques of the locale. The outside dining area had a roof of entwined live grapevines which gave the feel of being in the woods. Cacabelos has many bodegas (wine cellars) and produces a red wine from the Mencia grape which was ostensibly brought to the region by a French pilgrim.The white wine is from the La Godello grape. In this area if you identify yourself as a pilgrim, you are given a free glass of wine and a tapas. Ahhh…perhaps, that is why there is an increased number of pilgrims 😊. 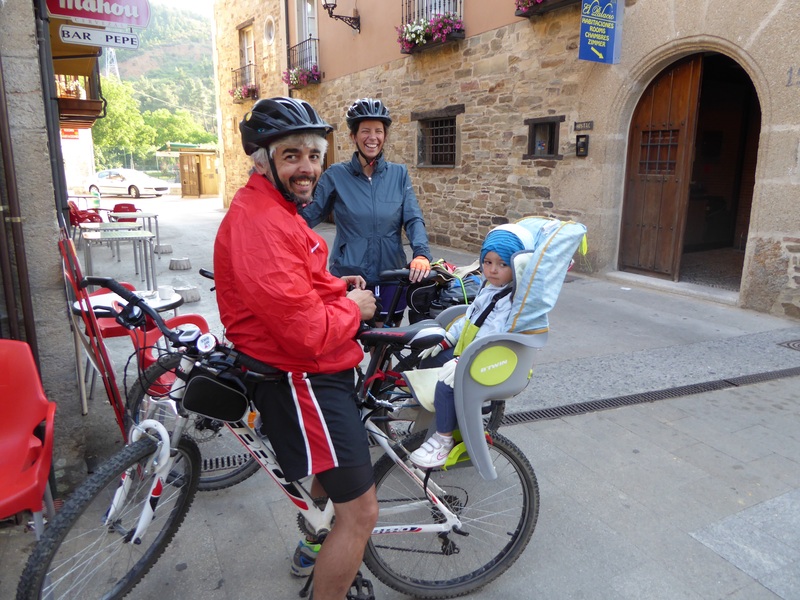 Here was the family with a two year old, doing the full Camino… On bikes – most riders do 60 km a day. 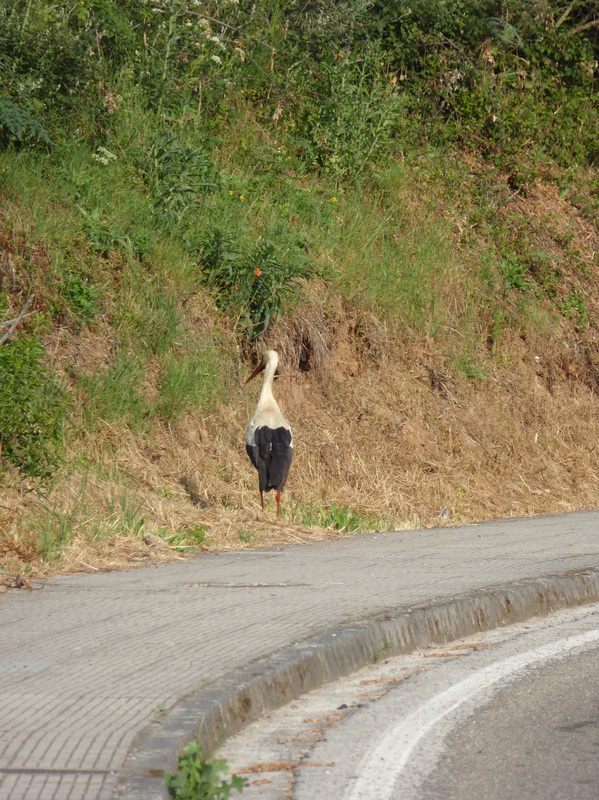 This guy is the first stork that we have seen actually walking the Camino! Wine country. 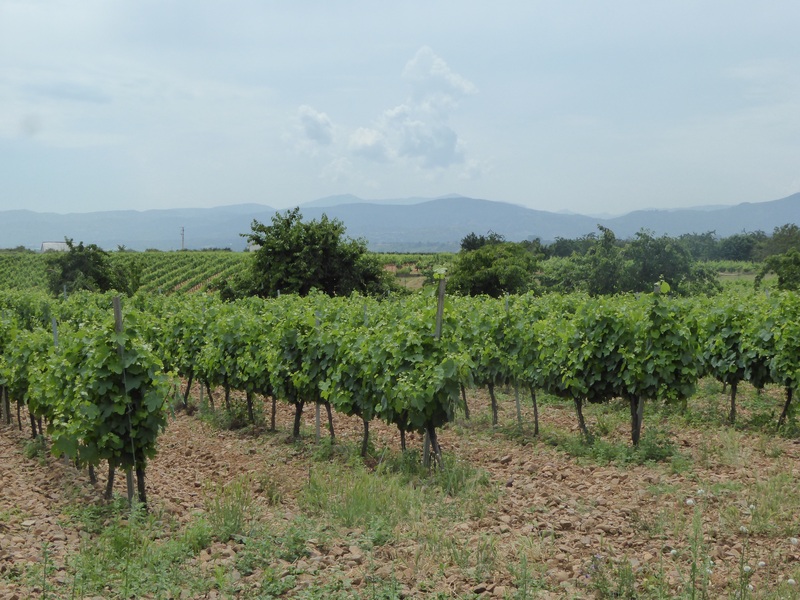 The vineyards are so well maintained. Delana has been waiting to find poppy seeds. This was the day…. Hopefully next year we will have these same poppies at Forever House! There is a “notch” in the tree line on the furthest / highest hill on the skyline. That is the location of the Cruz de Ferro that marks the high point of the Camino. This gives you an idea of the distance of yesterday’s descent. 12 century Templar castle. I cannot imagine standing at the bottom of those walls having been told that we are going to storm them!